Acupuncture-moxibustion therapy (zhēn jiǔ liáo fǎ 针灸疗法) which mainly consists of both acupuncture (zhēn jiǔ 针灸) and moxibustion (ài jiǔ 艾灸) is an unique approach to medical care in China and is also an indispensable component of Chinese medicine (zhōng yī 中医). 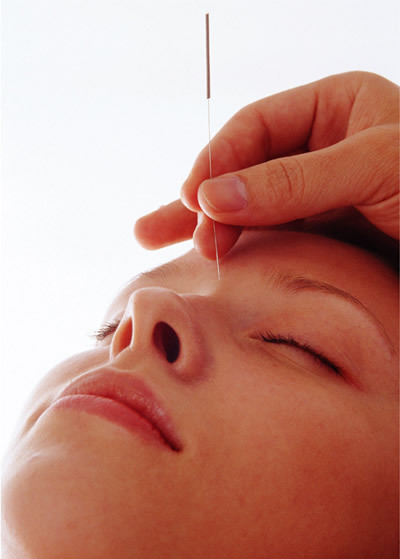 The acupuncture treatment is the insertion of different fine needles on the body's surface according to a certain point (xué wèi 穴位), to stimulate certain parts of the body and use various methods to evoke the channels (jīng luò 经络) as well as the vital energy (qì 气) of human body, in order to adjust physiological functioning of the body so to cure diseases. Moxibustion is the burning of moxa (ài 艾) on or near a person's skin as a counterirritant. For a long time, acupuncture and moxibustion treatment are often combined together in clinical practice application, therefore we collectively referred to them as Acupuncture-moxibustion therapy. In ancient China, people considered the kylin (qí lín 麒麟), the phoenix (fèng huáng 凤凰), the tortoise (wū guī 乌龟) and the dragon (long 龙) as sagacious animals, and called them the "Four Deities"(sì líng 四灵) as the symbol of auspice. 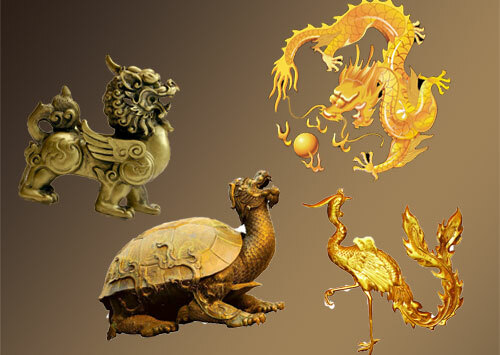 In fact, besides the tortoise, the other three are legendary animals created by ancient Chinese. As the first collection of poems in china, The Book of Songs (shī jīng 诗经) recorded a total of 305 poems created over a period of 500 years or so, from the early Western Zhou Dynasty (xī zhōu 西周) (11th century BC-771BC) to the middle of the Spring and Autumn Period (chūn qiū shí qī 春秋时期). It was said that specific officials were appointed with a sole role of collecting poems among the mass. There was also a rule requiring officials to compose poems and present them to the emperor at that time. The anthology came into being after further compilation. According to the story, all the poems in The Book of Songs were lyrics of the ancient days. At the very beginning, The Book of Songs was known as Poems (shī 诗) or Three Hundred Poems (shī sān bǎi 诗三百). The great thinker Confucius (kǒng zǐ 孔子) used it as a textbook to teach his disciples. 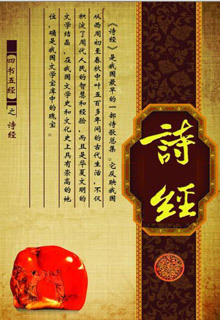 It was named as The Book of Songs after the Han Dynasty (hàn cháo 汉朝). 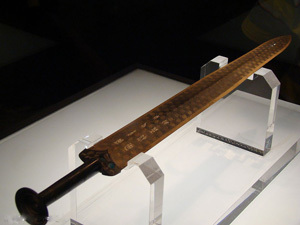 Sword of King Goujian of Yue (yuè wáng gōu jiàn jiàn 越王勾践剑) is a delicately made bronze sword, which is awarded as "the best sword in the world". It is 55.6 cm in total length, 45.6 cm in length of the sword body and 4.6 cm in width. It was discovered in 1965 in Jiangling (jiāng ling 江陵), Hubei Province (hú běi shěng 湖北省). Though buried for more than 2000 years, the sword shows no rust at all. It could lacerate more than twenty pieces of paper in one time. It is decorated with veiled rhombus patterns. The hilt of the sword is wrapped with silk thread, and embedded on one side with a blue glaze and on the other a turquoise glaze. There are eight Chinese characters on the sword “越王鸠潜，自乍用剑" (yuè wáng jiū qián, zìzhà yòng jiàn), which means that this sword is belong to King Goujian of Yue. The Terracotta Warriors and Horses of Qinshihuang Mausoleum (qín shǐ huáng líng bīng mǎ yǒng 秦始皇陵兵马俑), which is regarded as the eighth wonder of the world, is five kilometers east of Lintong County (lín tóng 临潼), 35 kilometers from Xi'an City (xī ān 西安) in Shaanxi Province (shān xī 山西). Qin Shi Huang (qín shǐ huáng 秦始皇) (259 BC - 210 BC), the first emperor of China, ascended the throne at the age of 13, when construction of his tomb began. On completion of his many conquests, he ordered 720,000 conscript laborers to hurry up on building his royal tomb. It was finished just-in-time in 210 BC for his use. 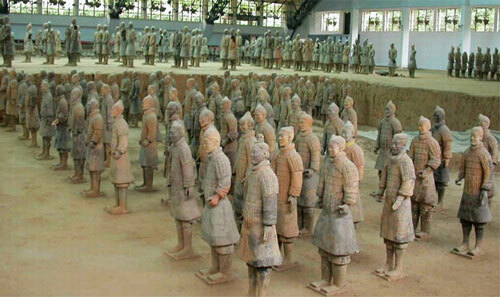 His son, the second Qin Emperor, saw Terra Cotta Warriors and Horses near the mausoleum to his entombment. 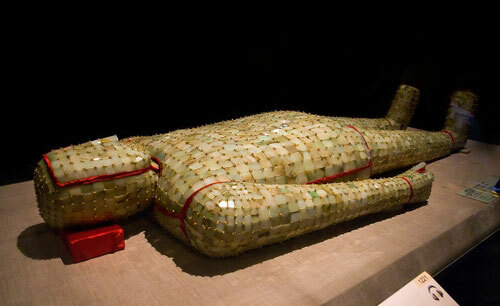 Also known as "jade casket" or "jade case", a jade burial suit (jīn lǚ yù yī 金缕玉衣) is a ceremonial suit made of pieces of jade in which only some nobles and emperors of the Han Dynasty (hàn cháo 汉朝) (202BC—9AD, 25AD—220AD) were buried. It was a top class burial suit at that time. A total of 49 complete and partial jade burial suits were uncovered between 1954 and 1996.